An introduction to the calculus, with an excellent balance between theory and technique. Integration is treated before differentiation -- this is a departure from most modern texts, but it is historically correct, and it is the best way to establish the true connection between the integral and the derivative. Proofs of all the important theorems are given, generally preceded by geometric or intuitive discussion. This Second Edition introduces the mean-value theorems and their applications earlier in the text, incorporates a treatment of linear algebra, and contains many new and easier exercises. As in the first edition, an interesting historical introduction precedes each important new concept. 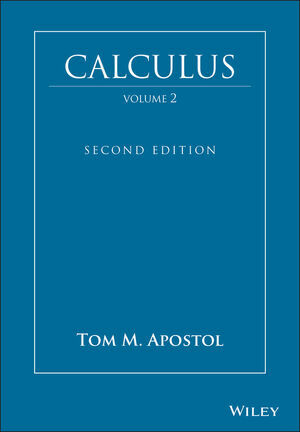 TOM M. APOSTOL, Emeritus Professor at the California Institute of Technology, is the author of several highly regarded texts on calculus, analysis, and number theory, and is Director of Project MATHEMATICS!, a series of computer-animated mathematics videotapes. Eigenvalues of Operators Acting on Euclidean Spaces. Differential Calculus of Scalar and Vector Fields. Applications of the Differential Calculus. Set Functions and Elementary Probability.